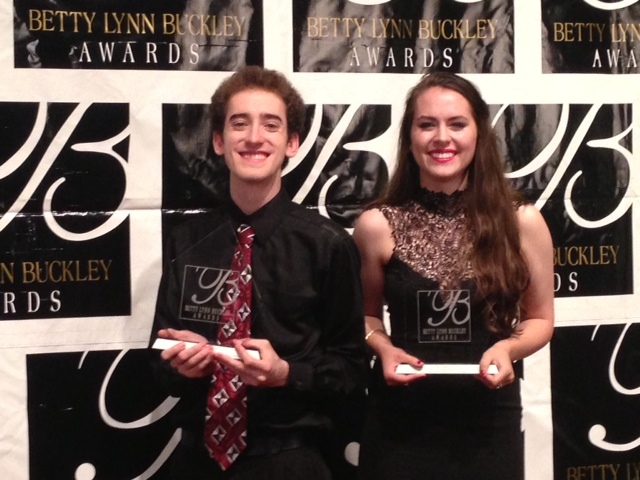 Local high schoolers collected the hardware Thursday night at the annual Betty Buckley Awards. With talent to spare and the charm of seasoned professionals, students filled the house at Fort Worth’s Casa Mañana Thursday night for the 13th annual Betty Buckley Awards. These musical theater awards promise to showcase high school’s top thespians, and the audience wasn’t disappointed. More like a mini Tony Awards than a high school ceremony, the Buckleys single out the crème de la crème in student theater. This year 18 schools from Tarrant, Denton, Hood, Parker, Wise and Johnson counties got in on the fun, and the audience was treated to six, polished performances from the Best Musical nominees. One of those was a production of The Drowsy Chaperone by the Fort Worth Academy of Fine Arts. Senior Benjamin Allen says he’s been hooked on theater since freshman year there. Ben’s school didn’t get the best musical nod, but he nabbed the Best Male Actor trophy. That means he’s headed to New York this summer to compete in the National High School Musical Theater Awards. He admits he’s just the tiniest bit excited. “And so I’ve heard for four years New York is so great, New York is so awesome and now I finally get to go see it! I’ve over the moon, I can’t wait,” Ben says. Joining him in the Big Apple this summer will be Grapevine High School’s Sarah Roach who was named Best Female Actor for her Velma Kelly in Chicago. She was floored by the win. “Surreal? I don’t know! I’m really hyped up, and it’s awesome!,” Sarah says. Chicago also won Best Musical this time around, something Sarah was equally excited about. She says the friends she’s made thanks to theater mean the world to her. Both Sarah and Ben will study theater in college and pursue a career in the industry. They know it’s going to be a hard road, but they both say they’re ready to walk it.